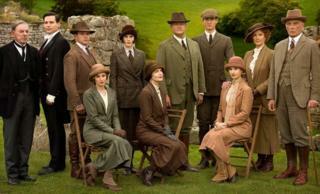 ITV's hit period drama Downton Abbey will be honoured by Bafta with a special tribute night, attended by the cast and crew. The show, which ends this year after six series, has been a worldwide hit and helped launch the careers of Lily James, Joanne Froggatt and Dan Stevens. It regularly achieves audiences in excess of 10 million in the US and the UK - and even featured in Iron Man 3. However, the show has never won a major Bafta award. It was recognised for best direction and best sound at the academy's 2011 ceremony, but has only been nominated for best drama once, also in 2011, when it lost to Sherlock. None of the ensemble cast - led by Hugh Bonneville and Dame Maggie Smith - has ever won an award for their contribution to the show. Downton's executive producer Gareth Neame said: "I speak for the entire cast and crew when I say how honoured we are that the Academy will recognise the show with this special award. "Not only is Downton a much-loved show in Britain, it has had huge success in both the US and right around the world, waving the flag for Britain and our creative content and that's why the Bafta recognition means so much to us all." Bafta's chief executive Amanda Berry OBE said: "I am delighted that Bafta is paying tribute to Downton Abbey, an extraordinary series that has flown the flag for British drama since 2010. Our tribute will take us backstage with the cast and crew to reveal what's made it both a national treasure and a global phenomenon." The tribute, which takes place on 11 August, will be broadcast on ITV later this year. The costume drama, written by Oscar-winner Julian Fellowes, follows the trials and tribulations of the Crawley family - and their staff - after the sinking of the Titanic leaves their estate without an heir. It has won 11 Primetime Emmy Awards and three Golden Globe awards in the US.